The Fayetteville Community SNAP Garden’s mission is: to create long-term food security for SNAP participants by providing the opportunity, resources and knowledge to grow their own safe, nutritious and local food in a community environment. 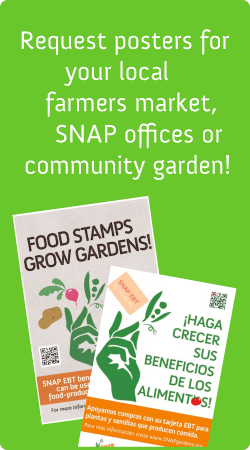 The Fayetteville Community SNAP Garden’s goal is: to work with community partners to build participation in and ownership of growing fresh food together with SNAP families, residents and by facilitating regular community gardening hours, providing gardening supplies (tools, water, soil, etc.) and on-site gardening seminars. to provide a model for replicating the Feed Fayetteville SNAP Garden initiative with our regional partners in 6 other community and/or school gardens in the Benton/Washington County area of Northwest Arkansas. The mission of Feed Fayetteville is to alleviate hunger and create community food security by cultivating a local sustainable food network. Our website is: www.feedfayetteville.org. Follow us on Facebook: www.facebook.com/FeedFayetteville or on Twitter @feedfayetteville. Feed Communities is an incorporated 501(c)(3) organization founded with the vision of supporting and expanding local food systems as a means of cultivating durable solutions for food insecurity. We work with individuals, organizations, local government and foundations to create sustainable partnerships for increasing access to healthy foods. We facilitate food system efficiencies by aggregating similar services, supporting our program partners who are already doing great work and then identifying potential program partners to fill in any gaps as needed. Our website is: www.feedcommunities.org and you can follow us on Twitter @feedcommunities.